Motifs specializes in interiors, but Meyer expresses her classic, eclectic style with fashion accents and (duh) baby gear. She used to drive to Bozeman to buy conscionable clothing from a company called Aden + Anais. Now, her toddler daughter and new baby son will be stylin’: Meyer’s store carries the full line. Their look: Sweater, skirt and shoes from the Blue Rose. Jacket from Cabi bought through Kelly Harp. Earrings are from Motifs. 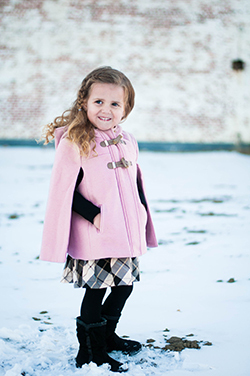 Marias’ jacket from Bumps ‘n Bundles (children’s boutique in Billings). Dress from Nordstrom and shoes from Target.